Have you been to Manjula's Kitchen? I love it there. Manjula cooks up mouth-watering Indian dishes, like Chola Tikki, a crispy chickpea and potato cutlet. All of her dishes are vegetarian, though not all are vegan, but I can find just about any Indian dish I want, there. In addition to providing recipes, Manjula offers some videos of her cooking, which is where I watched her make Chola Tikki. 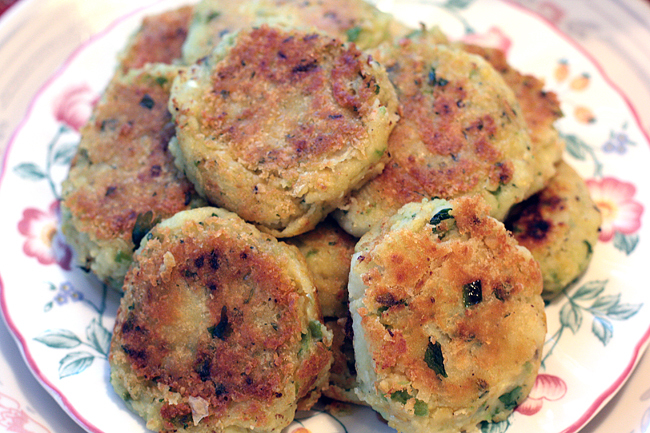 I made chola tikki to go with the soup we were having for supper, and it made a great accompaniment. I'd been wanting to visit Alki Beach in West Seattle because it's supposed to be so beautiful. 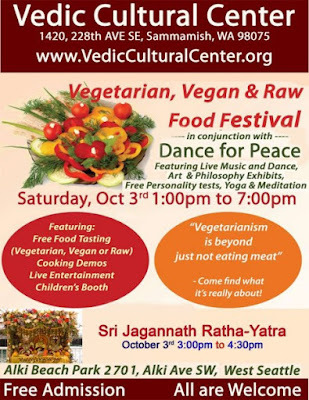 When I saw a notice for a vegetarian, vegan and raw food festival (above), I thought it would be a great opportunity to learn more about raw foods, take in some performances, learn something new and see the beach at the same time. 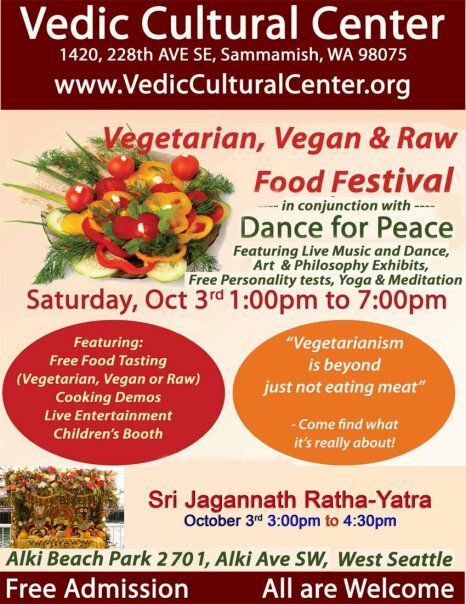 When we arrived there were two tables set up, one piled with copies of the Bhagavad Gita, and another at which plates, heaped with an assortment of food, were being handed out. My husband and I accepted a plate of food which we decided to share. 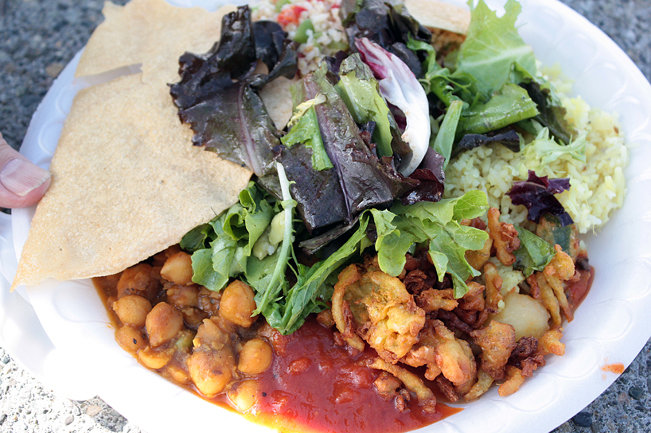 Most of the food was Indian, but there was also a pile of tabouli and a green salad. The food was simply handed out - no demos, no discussion. There were no exhibits and no music while we were there. So, we got our plate of food to share, and set about looking for someplace to eat it. We were kind of freezing - the wind was extreme - but we really wanted to eat at the beach near the water. We'd only taken a few steps away from the table when the chapatti blew right off the plate! We got another, and wandered towards the water to sit on a low wall. As I snapped the photo of our plate, my husband had to hold onto our replacement chapatti so it wouldn't blow away; you can see his thumb in the picture! The food was incredibly delicious - maybe the best Indian food I've ever had. This was our view of the Sound while we shivered and ate. You can see how choppy the water was. We didn't hang around long but now I'm sorry I didn't try to find out more about the food and who had prepared it. Those chola tikki look absolutely fantastic! Thank you, Monique! They were totally excellent. Looking at the photo makes me want more. 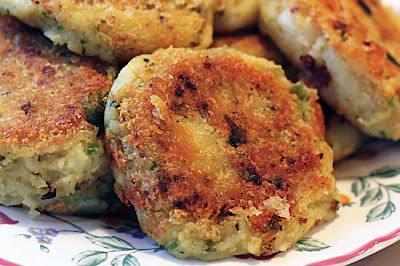 I have tried those cutlets once and liked them very much. I am sure the recipe you tried was a hit, thank you for sharing the link! Wow the plate from the food festival looks gorgeous! To sad you weren't able to talk about it. The food from the "food festival" was fabulous. I wish it had been more of a learning experience for the attendees. They do look wonderful.I love food like this. Thanks. No, I'm not familiar with that edition. I love food like this, too. Manjula's blog is a real treasure. Mmm I feel like chola tikki now! They look wonderful!